Searching the web for kids-friendly educational websites is absolutely a time consuming task. It takes a lot of scrutinizing and filtering to weed out the good from the chaff. Part of our job here in EdTech and mLearning is to help teachers and parents find out and access trusted websites to use with their kids. In this regard, we published a beautiful poster a few weeks ago featuring some key kids safe search engines to help young learners navigate the web safely. Today, we are sharing with you two more digital platforms that provide a wealth of educational materials for kids. 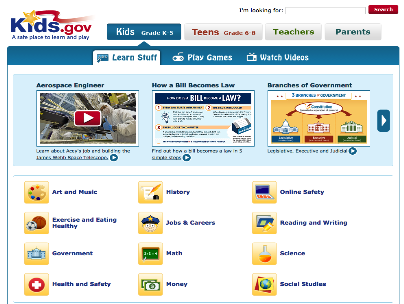 Kids.gov is the official kids website for US government. It provides a number of key resources and materials designed specifically to attend to kids learning needs within a secure and safe place. 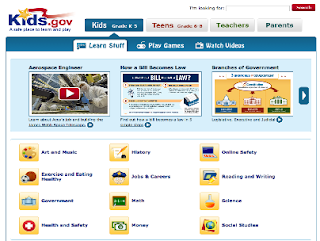 Resources in Kids.gov comes from different sources including government agencies, schools, and educational organizations. All of these materials are arranged into four main audiences: Kids (Grades K-5), Teens (Grades 6-8), Teachers and Parents. Each audience tab is divided into educational subjects like Arts, Math, and History. This is part of the popular Smithsonian website. 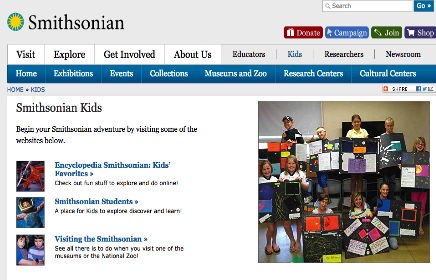 Smithsonian Kids features content tailored specifically for young learners. Examples of this content include: Encyclopedia smithsonian Kids (provides fun hands-on stuff to trigger kids learning), Smithsonian Students (provides kids with the tools to help them explore, discover and learn), and Visiting the Smithsonia (a place where students get to learn about what they can do when they visit one of the museums or the National Zoo).